Lock in a great price for Apartamentos Mansión Tropical – rated 8.7 by recent guests! Best value for our money. Cleanliness. Having our own kitchen to cook meals. Fresh towels every day. Nicely decorated and safe. Your car is in a locked carport. Relatively noise free. Good air condition and and overhead fan. The unit was more than adequate for our needs and very quiet even though it was in the middle of a residential area. We would stay again. The colorful interior and plants everywhere were very pleasing. Very clean and comfortable air conditioning was great in that climate. Felt very safe at night—excellent security. Cooking facilities very good. Super cute, big apartment with everything you need and free parking in the property. They even had oil and salt and pepper to cook! We loved it there!! 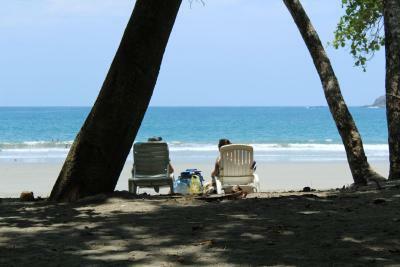 Several great restaurants and activities were close and Manuel Antonio beach was only a short Uber or taxi ride away. The staff was great about keeping the property clean and the amenities were incredible for the price. We always felt safe and were provided with keys to both the front gate and our apartment gate to come and go whenever. The apartment also included a kitchen complete with a refrigerator, freezer, microwave, and stove. The property is very secure as there are several levels of internal security. If you have a car, request parking in advance. The garage can probably hold 4 cars at one time. It is very nice to have an indoor locked parking garage in this town. 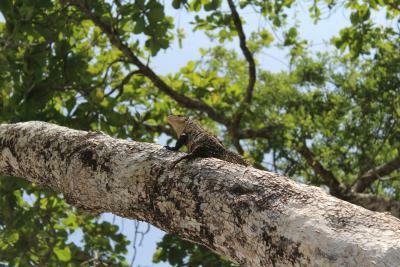 I like that it was close to the Manuel Antonio area. Also the lady at the front desk is very nice and helpful. I loved this place. The pics did no justice. This place was super cozy and cute. Beds comfortable, fan blew really hard. Great customer service. The lady Nila is awesome she cleans your room and dishes place was spotless!! Set in Quepos, 4.3 mi from Manuel Antonio National Park, Cabinas Mansión Tropical features air-conditioned rooms and free private parking. You will find a coffee machine in the room. All rooms include a private bathroom fitted with a shower. Cabinas Mansión Tropical features free WiFi throughout the property. A flat-screen TV is provided. Canopy is 1.1 mi from Cabinas Mansión Tropical. The nearest airport is Tobías Bolaños International Airport, 36 mi from the property. 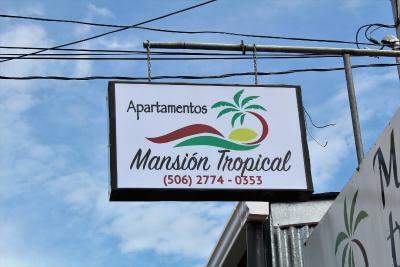 When would you like to stay at Apartamentos Mansión Tropical? This apartment features a kitchenware, tile/marble floor and air conditioning. House Rules Apartamentos Mansión Tropical takes special requests – add in the next step! Apartamentos Mansión Tropical accepts these cards and reserves the right to temporarily hold an amount prior to arrival. The language spoken at the property is Spanish. You will pay at the property. I recommend, safe parking for our car, all perfect, a little bit outside the center but the city is small and center is about 10 min walk, and you can experience the local life among the Ticos. Highly recommended. Very helpful staff indeed. Apartment nice and clean with your own kitchen and bathroom. Close to bus terminal. The location is really far off almost everything. The checkout process was very annoying. First, it was - unlike most hotels in CR - at 11:00 and not at 12:00, second, the management knocked at my door at exactly 11:01 and got me out from under the shower. When I allowed them to clean the kitchen and the bathroom, while I was packing my stuff, they refused and threatened me with some sort of penalty pay. This behavior confirmed the lack of service the whole week, where I just couldn't get anyone to help me out and even when I wanted to pay my room there was no one to be found. The hotel rooms are an extension of their house, and they are there when they are there and they don't care. A little bit of a walk to the bus station. However taxi is only 2 dollars. Although the accommodation wasn't in a picturesque area it was very cleverly designed to make the very best of the outlook. Excellent, well equipped apartment. Not quite comfortable walking around the area at night, although we were assured it was very safe. Not a lot of good restaurant options close by. Not sure if the location really mattered. Quepos did not seem to be as clean a town as others we have been in in Costa Rica. There are huge street gutters to cross and some unpleasant smells. The boardwalk to the marina is very nice and dining at the marina restaurants is actually inexpensive. Everything was great. Would be great if there was coffee. The place is close to bus terminal, grocery store, restaurants and cafes. It is clean. We had a kitchen with all basics and a fridge. The room had air conditioning. We found some sodas nearby. Great experience overall. The location is not very close to the bus station Hot water in the shower didn’t work properly. The place is great, clean and very quiet. Sketchy corner of Quepos, but just a short walk to the grocery store. Super clean and perfect kitchen! The place is a bit far from the city center (quepos). There are many homless and drunks in quepos and it is not pleasent to walk there a night. The place was clean and coozy.